For questions about Sun.exe, the Windows “Notification Area” app, see FAQs - Sun.exe. More questions regarding the equinoxes and Astronomy are on the FAQs - Astronomy page.
? I would like the calendar to print on one page only. What's the best way to do this?
? How can I get a future or past, sunrise, sunset or moon time?
? How can I make a bookmark or save a link to the calendar page that will default to the current month?
? Why is the rise or set time off by one hour?
? How accurate are the times on this site?
? Please explain more about rounding. What errors might show up and why does the site do it?
? Has this site been updated for changes of the rules for daylight saving time in the USA, Canada and any other countries?
? What elevation is used to calculate the times?
? What is the difference between “solar noon” and “directly overhead”?
? How about adding high and low tide to your times?
? Can you send me the algorithms you used to calculate sunrise and sunset?
? Can I publish the data provided by this site in a newsletter, my web site, an email, a magazine, etc.? Can I link to the site?
? I am getting “Secure Connection Failed” or a similar error while trying to browse this website. Can I use a non-secure connection, i.e. http instead of https?
? Can I get the times for more than one month on one web page?
? Can I get this data in CSV (comma-separated values) format?
? I’ve got a question you didn’t cover. Where else can I look? Q: I would like the calendar to print on one page only. What's the best way to do this? A: Modifications have been made to SunriseSunset.com to improve the site and to ensure that the site remains available as a free service. The changes have been reviewed and it is believed that they do not affect the original mission of the site. Some changes, such as adding the Day Length option, have increased the possibility that the calendar may not print on one page. Try selecting the largest font size, near the lower right under the calendar, as it will abbreviate many words, eliminate blank lines and the moon phase time. We have found that you can choose the moon phase option and one other option, such as civil twilight. The calendar will then almost fit on one page by default, you will probably need to choose the landscape print option and adjust the printer margins a little, see the next two paragraphs. Choose the link “Printer Version”, near the lower right, when you are ready to print your calendar. This will open a new tab or window with the current calendar without the ads or links on the page. You may still need to adjust the page orientation or print size in your browser to have it print on one page. In your browser on the Print Preview..., Page Setup... or Print Options... windows, you can find the following settings. Try changing the page orientation to Landscape instead of Portrait to get the calendar to fit the page better. If the month you are printing requires six rows to print all the weeks, then Portrait may be the better choice. If it still doesn't fit, in the Print Preview window find the Page Size percent and adjust the number down, some browsers have a “Shrink to Fit” option to automatically do this. You can also adjust the top, bottom, left and right margins to increase the available print area. Q: How can I get a future or past, sunrise, sunset or moon time? If you cannot find your location, you can email us or enter that location on the custom page with latitude, longitude and time zone information. Q: How can I make a bookmark or save a link to the calendar page that will default to the current month? For this example, click on “August 2016.” You can now save (drag it to the desktop) or bookmark the address, aka the link or URL, in the top bar of your browser. To make it choose the current month, edit the URL, find where it has month=8&year=2016, change it to month=-1&year=-1 and now bookmark it or save it. When you use that link it will default to the current month and year. There is more info on linking to the calendar.asp page and the URL here. Q: Why is the rise or set time off by 1 hour? I found a sunrise, sunset or moon time on another web site, the TV or the newspaper and it is different from the one here by an hour. What is the difference and which one is correct? A: It is probably because one of the times is not being adjusted to daylight saving time (DST) properly. All times shown on this web site are adjusted to DST using these rules. If all days of the month are during DST, the calendar will have the phrase “Daylight Saving/Summer Time is in effect for the entire month” near the bottom. “DST Begins” or “DST Ends” will be printed with the day if at any point during the month it transitions to or from daylight saving time. When DST is not in effect for any day of the month or that location never observes DST, then “Standard/Winter Time for entire month” will be displayed at the bottom of the calendar. You do not need to add an hour to any times, unless the time shown is standard time and you know that the location will be observing daylight saving time then. If this is the case, add one hour to the times. To verify the settings your calendar is using, select the checkbox “Latitude, longitude and time info” when making your calendar. If you are already on the calendar, select the “Modify Settings” link at the bottom of the page and check the checkbox there. You can also view and change the time zone or DST region or any other data on that page. Q: How accurate are the times on this site? I found a sunrise, sunset or moon time on another web site or the newspaper and it is different from the one here by a minute or so. Why are they different? A: Please read the Accuracy Statement and the next question. The algorithms used are “generally accurate to within one minute.” The times are rounded either up or down, to a minute. This would explain the difference. Q: Please explain more about rounding. What errors might show up and why does the site do it? From an actual email: I'm an 8th grade science teacher and my students use your site to graph the day length. The students noticed the day length times on the site do not always match the times they calculated. A: What the students are seeing is a rounding error. The actual calculation for day length uses the rise and set times in hours, minutes and seconds, but the resulting numbers are rounded to the nearest minute for display purposes. The sunset shown is one minute later, but the day length show is the same as the previous day. Remember that all times on the site are generally accurate to within a minute, this is because it is practically impossible to calculate to the exact second when sunrise or sunset will occur. Why is that so? See the Astronomy page. Q: Has this site been updated for changes of the rules for daylight saving time in the USA, Canada and any other countries? A: Yes, this web site uses these rules for all DST adjustments. Q: What elevation is used to calculate the times? A: The elevation is always calculated at sea level. Mountains and other large landmarks may also affect local times, these are not accounted for in the times presented on this Web site or the Windows Sunrise Sunset Calculator. Read more in the Astronomy FAQs. Q: What is the difference between solar noon and “directly overhead” or “high noon”? A: These are colloquialisms for general noon or midday. Solar noon is the time when the sun appears highest in the sky (toward the north or south pole) for that location. Q: How about adding high and low tide to your times? A: We won't be adding tide information, it is too complicated. There is nice Windows program available for free that does tides. You can find it at WXTide32. Q: Can you send me the algorithms you used to calculate sunrise and sunset? A: No, but you can search the internet and find code that others have made available. I got my algorithms from a book, “Astronomical Algorithms” by Jean Meeus, ISBN 0-943396-35-2, published by Willmann-Bell Inc. He also has a book “Astronomical Formula for Calculators”. Q: Can I publish the data provided by this site in a newsletter, my web site, an email, a magazine, etc.? Can I link to the site? A: Yes, just try to include a link or a reference to sunrisesunset.com if possible. Where, %20 is a space (use a hex ASCII or UTF-8 number), 87.6298 is longitude (negative for east), 41.8781 is latitude (negative for south), -6 is the time offset in hours (positive for east of GMT) and the 1 is the DST region number used on this site; see rules at DST info page). To have the calendar choose the current month and/or year, set either or both to -1, e.g. &month=-1&year=-1 . The server is located in the Eastern time zone of the U.S. and will use that month and year. Q: I am getting “Secure Connection Failed” or a similar error while trying to browse this website. Can I use a non-secure connection, i.e. http instead of https? You can also change https to http in your brower's address area. Q: Can I get the times for more than one month on one web page? A: No, this site creates calendars for one month at a time only. 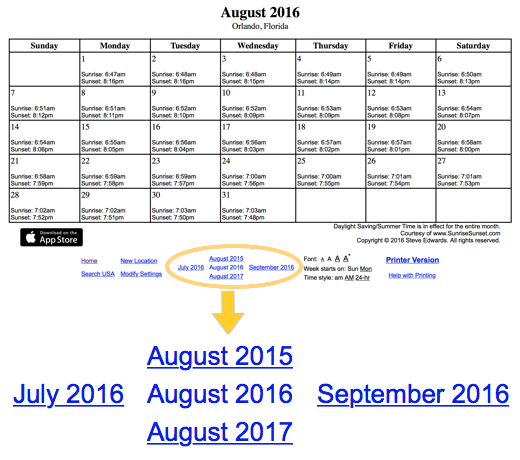 To create additional monthly calendars use the navigation links at the bottom of the calendar. These links allow you to go forward or backward in monthly or yearly increments. Q: Can I get this data in CSV (comma-separated values) format? A: This web site does not produce data in CSV format. Our iPhone/iPad app has an option to provide a CSV file, see EdwardsApps.com. Please email us if you have this or any other special request. Q: I've got a question you didn't cover. Where else can I look?